Demonstrators hold banners on the Northern Ireland/Republic of Ireland border, near Newry in Northern Ireland, Jan. 26, 2019. 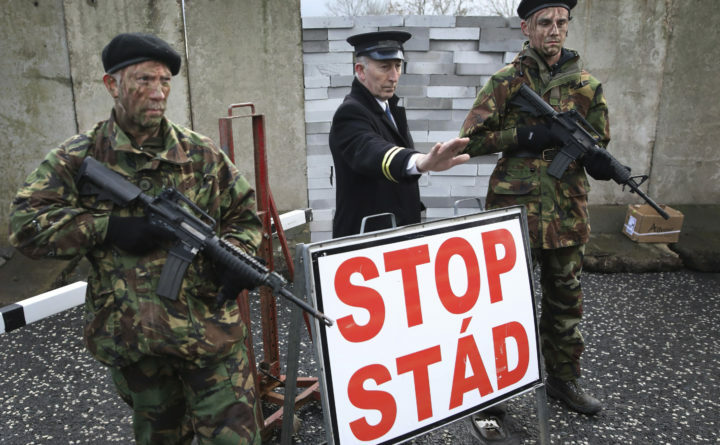 Protesters angered at the prospect of a hard Brexit built a mock wall across part of the Irish border, the theatrical gesture was the centerpiece of a County Down demonstration against future border checks. On Tuesday, the British parliament rejected Prime Minister Theresa May’s “deal” for Britain’s exit (“Brexit”) from the European Union, painfully negotiated over more than two-and-a-half years, by an overwhelming 149-vote majority. It was the second time parliament, including a large chunk of her own Conservative Party, rejected the deal she made with the EU last November. And the main reason both times was the so-called backstop: a commitment by May’s government to avoid a hard border in Ireland at all costs. On Wednesday, the British parliament also rejected a proposal that Britain just leave the EU without a deal. “Crashing out” would mean instant customs barriers at the United Kingdom’s port, airports and land borders, with immense disruption of trade including food imports and industrial supply chains. It would be an economic disaster. If your local day care was this feckless, you’d move your children at once. It’s all about the “backstop.” That’s why parliament won’t pass May’s deal, and it’s why the EU refuses to re-negotiate it. May’s November deal with the EU promised that the U.K. would stay in the existing customs union with the EU, and also remain closely aligned with the single market that guarantees the free movement of goods, capital, services and labor across the whole EU — until and unless the two parties negotiate an alternative arrangement that keeps the inter-Irish border unpoliced and almost unmarked. If you drive the 310-mile-long border between the Republic of Ireland and Northern Ireland, which is part of the U.K., the road crosses it dozens of times (there are 270 vehicle crossings). The only way you know you have crossed the border again is that speed limits are posted in kilometers in the republic, but in miles in the North. The killing ended with the Good Friday agreement of 1999, which managed to achieve a compromise between the Protestants of Northern Ireland (who feel British) and the Catholics (who mostly identify as Irish). There would be power-sharing at government level, and the border with the Republic would become invisible. The Irish nationalists in the North could even have Irish passports instead of British ones. Brexit is almost entirely an English nationalist project — Scotland and Northern Ireland both voted to remain in the EU — and the Brexiteers just ignored the fact that leaving the EU would sabotage the Good Friday deal by creating a hard border in Ireland. There would have to be customs officers and passport checks, or else there would be huge amounts of smuggling and an uncontrolled flow of illegal migrants. But a hard border would bring the war back, even though most people don’t want it. The population on the U.K. side of the border is overwhelmingly Catholic, and any attempt to control the border without putting officials on it will fail: the local people will just destroy the cameras and other sensors. But put in customs officials, and you will need police to protect them — and soon enough you will need soldiers to protect the police. Welcome to the Troubles, volume two. So the Irish government demanded that the border stay open and invisible. It is and will remain a member of the EU, so that became EU policy. Which means Northern Ireland (and therefore all the rest of the U.K.) must stay in the customs union until someone comes up with a magical method for controlling the border invisibly. That’s why the backstop was necessary, and May accepted that when she signed the deal last November. But she cannot sell it to her own party’s hard-line Brexiteers, let alone to the other parties in parliament. Magical thinking still rules, and the arrogance is as breathtaking as the ignorance.